Hacked emails have confirmed the suspicions of Senator Bernie Sanders' followers that the powers that be in the Democratic National Committee-- who are supposed to be neutral-- in fact sought to rig the system against him and his campaign. Collectors, both here and in Germany, already know that feeling. In the US, the State Department-- which is supposed to be neutral when it comes to deciding whether foreign requests for MOUs meet the criteria in the Convention on Cultural Property Implementation Act-- has never rejected one. Even worse, when a last minute effort to engineer import restrictions on Cypriot coins was turned down by the State Department's own Cultural Property Advisory Committee, the State Department's Bureau of Educational Affairs imposed them anyway and then went so far as to mislead the public and Congress about CPAC's true recommendations. That, of course, gave the State Department bureaucrats license to do the same with other coins from Bulgaria, China, Greece, and Italy, citing the Cyprus decision as "precedent." The situation is even worse in Germany. There almost 50,000 collectors and dealers made their valid concerns known about a draconian new law, but CDU Culture Minister Monika Grutters rammed it through anyway, cheered on only by a small group of mostly authoritarian cultural nationalist countries and the German Archaeological Institute, which is part of Germany's Foreign Ministry. Again, the desires of connected insiders associated with the archaeological lobby and the bureaucracy seemed to take precedence over the concerns of ordinary people and small businesses. THE RIGGED SYSTEM has been a subject very much in the news lately, during the contentious US Presidential primary season and the tense RNC and DNC political conventions that followed. We’ll will never be able to fix a rigged system by counting on the same people who have rigged it in the first place. The insiders wrote the rules of the game to keep themselves in power and in the money. That’s why we’re asking Bernie Sanders’ voters to join our movement: so together we can fix the system for all Americans. So important. This includes fixing all of our many disastrous trade deals. … Because it’s not just the political system that’s rigged, it’s the whole economy. It’s rigged by big donors who want to keep wages down. It’s rigged by big businesses who want to leave our country, fire our workers, and sell their products back into the United States with absolutely no consequences for them. It’s rigged by bureaucrats who are trapping kids in failing schools. It’s rigged against you, the American people. There is another group of "forgotten Americans" who have been neglected, discriminated against and outrageously victimized by THE RIGGED SYSTEM: American collectors of antiquities and ancient coins. This is a long, sad story of how carefully crafted, well-intentioned legislation intended to even-handedly "protect cultural heritage" was unethically hijacked and ruthlessly twisted into a vehicle for embedding the archaeology lobby's anticollecting "crusade" in US Customs regulations by bureaucratic fiat. The villain in all this cultural evildoing is an unelected, "faceless" bureaucrat and sometime archaeologist: Maria P. Kouroupas, who has headed the State Department's Cultural Heritage Center and its predecessors for more than thirty years, and has formed that malevolent bureaucracy in her own ruthless and unscrupulous anticollecting image. Admittedly, collecting antiquities and ancient coins is a small stage by comparison to national politics. The fate of nations isn't at stake in a large sense. But the fate of hundreds of thousands of good, upstanding citizens is very much at stake, at least to the extent of their pursuit of happiness. The ethical sins committed by Debbie Wasserman Schultz and her political gang, who cynically sought to "rig" the Democratic presidential primary and Convention against Bernie Sanders and his idealistic followers, is being justly reviled now that it has finally been exposed. The seriousness of these ethical sins is amplified to a very great magnitude by what was at stake: nothing short of the Presidency of the United States of America. It is reasonable to think that had the political playing field been genuinely level and fair, Mr. Sanders might well have emerged as the Democratic nominee. The ethical sins committed by Maria P. Kouroupas and her bureaucratic gang, who cynically and very successfully sought to "rig" the US Convention on Cultural Property Implementation Act against US collectors of antiquities and ancient coins, despite intense and well managed efforts by the Ancient Coin Collectors Guild, still remain to be exposed. That has to date been successfully "stonewalled" by tenacious State Department legal resistance, based upon specious assertions of secrecy supposedly required by "national security interests." In reality, the reason for all this compulsive secrecy, which contravenes the Freedom of Information Act and every ethical principle of transparency in government operations, is that the machinations and behind-the-scenes rigging of the system by Kouroupas and her bureaucratic gang absolutely cannot stand the light of day. If what really happened is ever made public, their downfall would be as certain and drastic as that of Debbie Wasserman Schultz and her political gang. The seriousness of the ethical sins of Maria P. Kouroupas and her malevolent bureaucratic gang is compounded and amplified to a very great magnitude by what was at stake: nothing short of the good faith and honesty of the US State Department. Every US citizen should have the right to feel that the State Department fairly, even-handedly and honestly represents his or her interests in its necessary dealings with foreign governments and their interests. Kouroupas and her gang have made a disreputable mockery of this essential principle of our government, for no better reason than to advance the private agenda of the archaeology lobby, to which they are ideologically committed . WHEREAS, we support reasonable efforts to protect archaeological sites and public and private collections, we oppose the claims of those who say: (a) Anything “old” should be considered state property; (b) Anything without a detailed ownership history should be deemed stolen; and (c) Only foreign states and their favored academics should have the right to preserve, protect and study the past. THEREFORE BE IT RESOLVED that the Republican Party of Wisconsin, in convention assembled, asks lawmakers to oppose any import restrictions or other constraints on the collecting of art, books, coins, militaria, pottery, stamps, weapons and other common antique collectibles as a waste of valuable government resources. 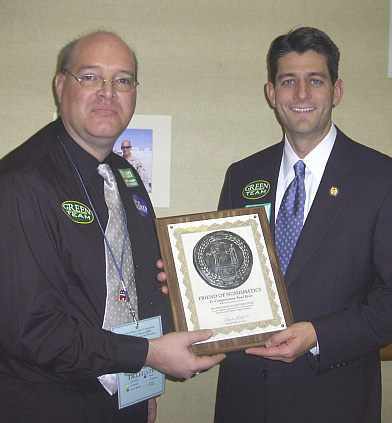 BE IT ALSO RESOLVED that the Republican Party of Wisconsin, in convention assembled, asks lawmakers to pass a bill exempting art, books, coins, militaria, pottery, stamps, weapons and other common antique collectibles for consideration from future import restriction and cultural property laws and treaties. Wisconsin is an important state in contention for the 2016 Presidential election, which is presently viewed as leaning Democratic, but could possibly be won by the Republicans with a strong, well targeted campaign effort. The struggling small businesses of Wisconsin include Krause Publications, publisher of Numismatic News, World Coin News, and Coins Magazine, plus many important guides and catalogs for collectors. Candidate Donald Trump has a great many vital things to deal with in his attempt to win this election, and the interests of US antiquities collectors and ancient coin collectors, in a quantitative sense, aren't yet clearly apparent on the political "radar screen." If the decisions of his campaign are based strictly upon quantifiable "vote math," it will be hard to justify taking a stand on ideological corruption in the State Department's Cultural Heritage Center. Mr. Trump has, however, made it clear that he is very much a man of principle and ideals. Perhaps his principles and ideals may be offended by the reeking rat's nest of bureaucratic corruption in the State Department's Cultural Heritage Center. There may not be enough of immediate political importance here to turn this into a campaign issue. But despite that, perhaps there is room for hope: the hope that a Trump administration will wield a vigorous "new broom," dedicated to thoroughly sweeping out all the rancid little corners in our government such as this, where rampant system rigging and unethical private bureaucratic agendas presently deprive worthy American citizens of fair, honest and honorable treatment by their government.